The City Hope Church new sanctuary stage includes a L-Acoustics KARA(i) loudspeaker system. When Daphne, AL’s City Hope Church—formerly known as Bay Community Church—hosted its first services in its new 1,400-seat worship center this past February, it was immediately apparent to those in attendance that a premium had been placed on quality sound. 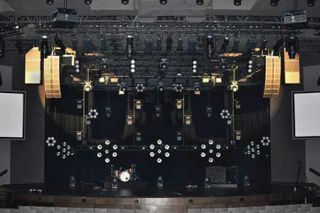 Key to this was the presence of L-Acoustics KARA(i) and ARCS WiFo loudspeaker systems specified and installed by Springville, AL-based AVL firm ESB Group Inc., an L-Acoustics Certified Provider. The church’s tremendous growth prompted its leadership to approve the construction of a new 35,000-square-foot building, of which approximately 75 percent is devoted to the worship center. “The new sanctuary more than doubles the church’s worship space, which was absolutely necessary because they were packing 600-plus people into a much smaller room for services,” recalled ESB Group Project Manager Nic Taylor. Taylor brings a unique perspective to the project. Not only is he a longtime member of the congregation, but he was also the church’s former technical director, a job he held for eight years before taking the position with ESB in July 2013. “Prior to this new construction, the church kept knocking down walls to keep up with the exploding growth in attendance,” explained Taylor, adding that all along, the previous loudspeaker system never really met the institution’s needs, especially in terms of intelligibility throughout the room. So, in the early stages of design planning, Taylor and his colleagues knew an L-Acoustics KARA(i) rig would deliver the audio clarity and coverage that had been missing from worship services in the old building. The church’s tremendous growth prompted its leadership to approve the construction of a new 35,000-square-foot building, of which approximately 75 percent is devoted to the worship center. Today, the new space benefits from 16 KARA(i) split into left and right arrays of eight enclosures, each flanked on the outside edge by a sub array of three SB18i flown in a cardioid configuration. Two SB28 per side under the stage anchor the low-end reinforcement, while eight tiny coaxial 5XT cubes mounted into the face of the stage deliver front fill. Two 12XTi enclosures serve as rear fills, with four ARCS Focus and four ARCS Wide functioning as side fills and delays, respectively. All systems are powered and processed by a total of nine LA4X amplified controllers, with the exception of the SB28s, which are run from a single LA8. Two Panasonic PT-DZ10KUs were used as side screens, with a Panasonic PT-DZ21KU for the center screen within the sanctuary. Two Midas PRO2s and one Midas PRO6 offer audio controls for the audio system, and a Shure PSM 900 system offers wireless services for the church. Typically on stage for worship services are five vocalists, two electric guitarists, one acoustic guitarist, one electric bassist, one keyboardists, and a drummer. “I wouldn’t say it’s rock ’n’ roll, but it’s definitely progressive,” Ard noted. Praising L-Acoustics’ ease of use and intuitiveness, he added, “Other than having ESB add a couple riser fills, I haven’t had to mess with anything—it’s been great.